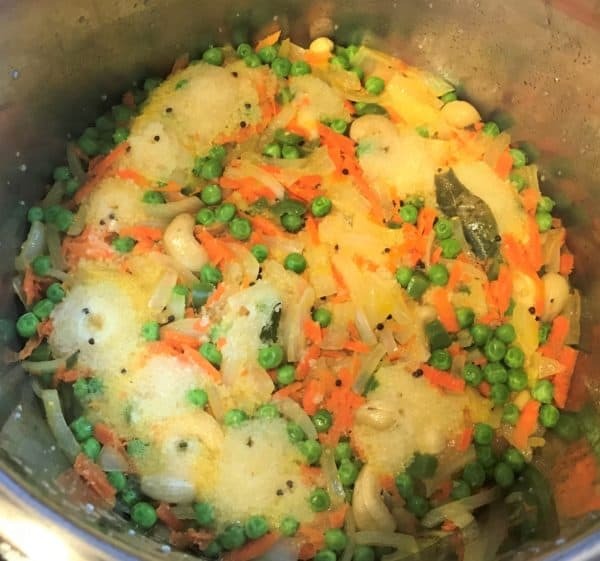 Vegetable Rava Upma / Rava Khichdi made in the Instant Pot or Pressure Cooker. 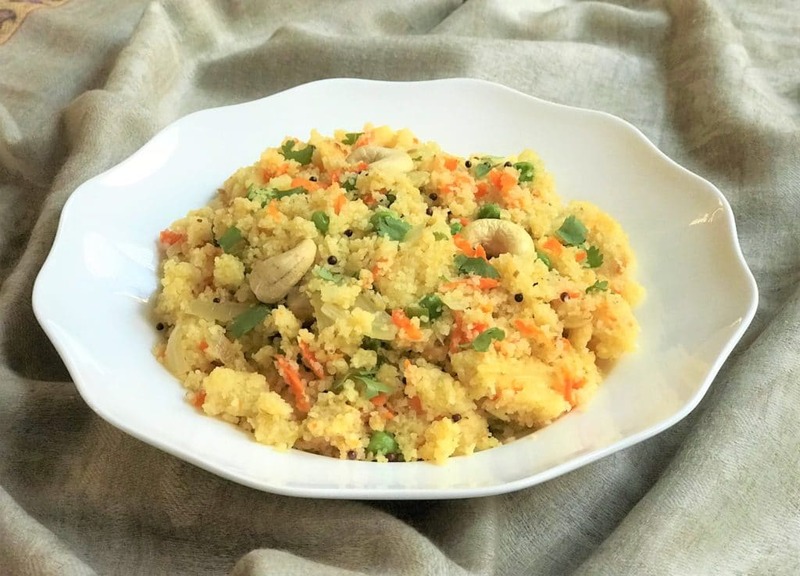 Rava Upma is an easy and popular South Indian breakfast. 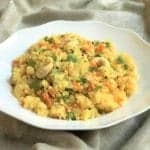 Rava Upma is a thick porridge made from dry roasted semolina, cooked along with various vegetables and seasonings. This is a delicious and warm breakfast, a great way to start the day along with a hot cup of coffee/tea. Upma is a popular dish served in many South Indian and Maharashtrian restaurants. Rava is also called Sooji, Semolina or Cream of wheat. Although it is a classic breakfast, there is no doubt it can be a nutritious lunch or dinner too. Other popular south indian breakfast dishes are Vermicelli/Seviyan Upma and Steamed Idli. 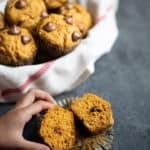 I love to make this in the morning, when I am craving warm breakfast with my tea. 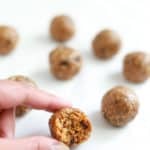 It takes just 15 minutes to make and I also get some veggies for a good start to the day! You can also make upma with other grains. Check out Vermicelli Upma, Broken Wheat/Dalia Upma and Quinoa Upma recipe. 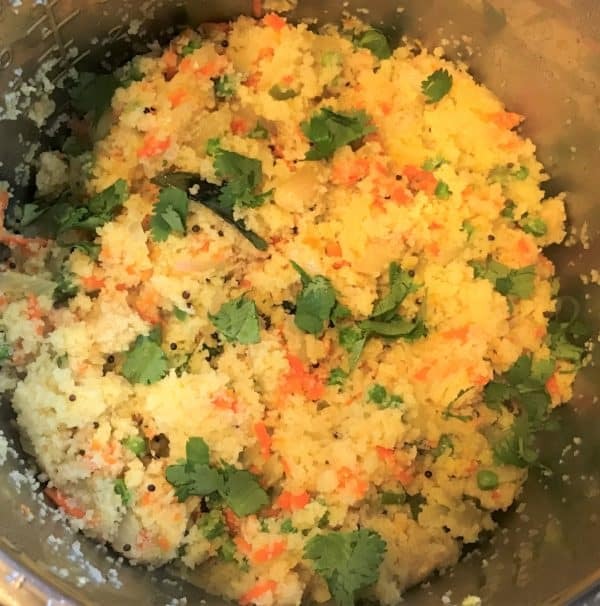 How to make Sooji Upma in the Instant Pot? 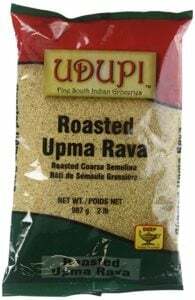 I usually buy roasted semolina, and skip the effort to roast it each time I am making upma or halwa. Some people like to buy Semolina and roast it in bulk themselves and store in airtight containers. Having roasted semolina reduces the cooking time drastically for making upma. This recipe is created with store brought roasted semolina. I like the upma to be dry and not sticking in the mouth when eating. I also add a variety of vegetables to make this a more nutritious breakfast. You can vary the veggies used or skip them completely, depending on your taste buds. I like to enjoy Rava Upma with Coconut or Mint Chutney. My hubby is from Central India, where sev or bhujia is very popular. He loves to sprinkle some sev on the upma to get a crunch when enjoying upma. Check out other recipes with semolina – Rava Dhokla, Sooji Halwa and Orange Semolina Cake. 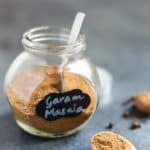 An easy and popular South Indian breakfast. Upma made from dry roasted semolina, cooked along with various seasonings and vegetables, perfect for a quick and nutritious breakfast. Start the instant pot in SAUTE mode and let it heat. Add oil and all the tempering ingredients. When the mustard seeds splutter, add green chili, onions and ginger. Saute for 2 minutes while stirring frequently. 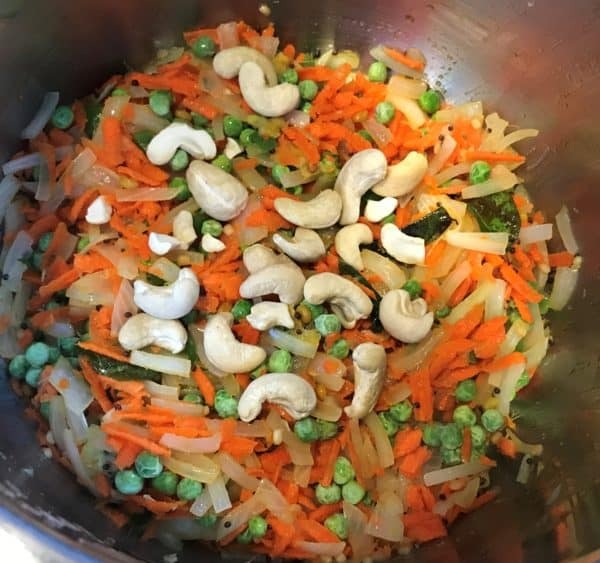 Add carrots, peas, salt and cashews. Stir well. If you are adding different veggies that take longer to cook, then saute them for a few minutes. Add roasted rava and water. Stir it all up and scrape if anything is stuck to the bottom. Close lid with vent in sealing position. Change setting to MANUAL or pressure cook mode for 2 min. The pin may or may not come up, but the upma will still be cooked in this time. When the instant pot beeps, quick release the pressure. Take the stainless steel insert out of the pot. Garnish with cilantro. Enjoy upma with chutney! 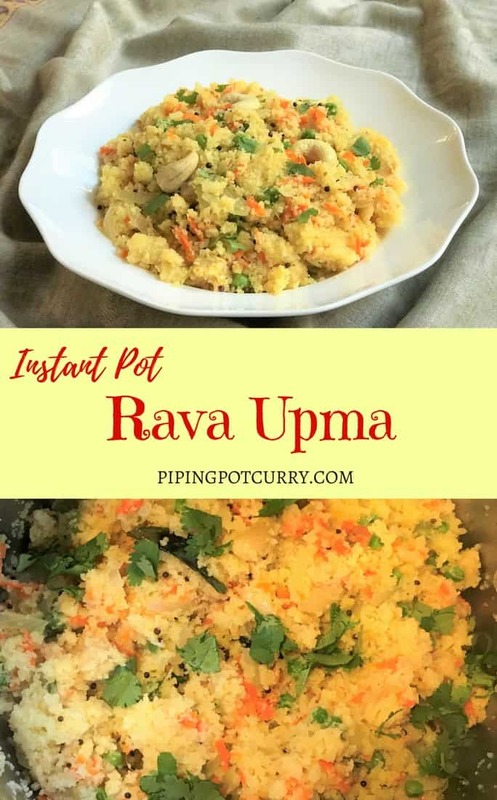 It is possible that when you open the instant pot and stir, some upma may seen sticking to the bottom of the pot. However when you let it sit for 5 minutes, it will loosen up and mix well with the rest of the upma. The newer models of Instant Pot have been made much more sensitive, because of which sometimes the recipes that were created in older models don't work as expected in them. If you get a BURN message, don't panic and just stop the pressure cooking cycle. Scrape off anything stuck to the bottom. If there is any unsoaked water, cook on saute for few minutes until all liquid is soaked. If all water is soaked, just keep the instant pot covered with a glass lid for 5-10 minutes and the upma should get cooked. I used 6 quart ultra and it came out well as described. I heated water on stove top and added that. I think it’s worth mentioning to add hot water in the recipe (it’s mentioned only in the comments right now). Some did get stuck to the bottom but most of it came out after 5 mins. Thanks! Hello – So glad to hear the Upma worked well. Thank you for the suggestion. I have mentioned heating the water in the ingredients. I hope that helps! 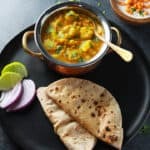 I plan on making this over the weekend 🙂 is it ok to skip the urad and chana dal? Hey Kiara – Yes, it would be fine even if you skip the urad/chana dal. Hope you enjoy it! Thanks! 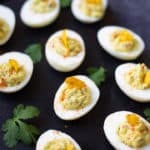 Any idea what setting I would use if I had to make poha in the instant pot? I was going to add the tempering, potatos, peas and washed poha and then cook at HP for 1 min and then do QR. Not sure if that’s right though? I have a new 8 qt, and you are right. I successfully made upma, poha and such recipes successfully in my older 6 qt, but now it is just not possible. So frustrating. Dont have the 6 qt anymore. Hey Daisy – Oh..I know it can be frustrating. I have heard so many people say that some recipes did not work for them in the 8qt. 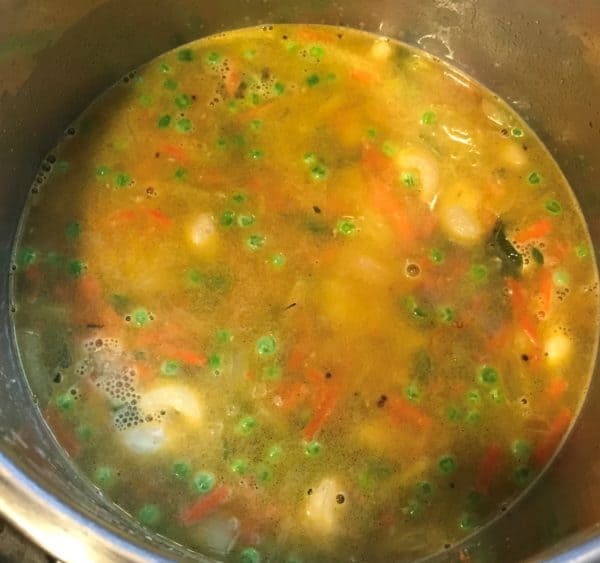 Based on what I have heard when using the 8qt, add a little more liquid and switch off sauté after adding the ingredients, so the liquid does not all dry up before pressure cooking. 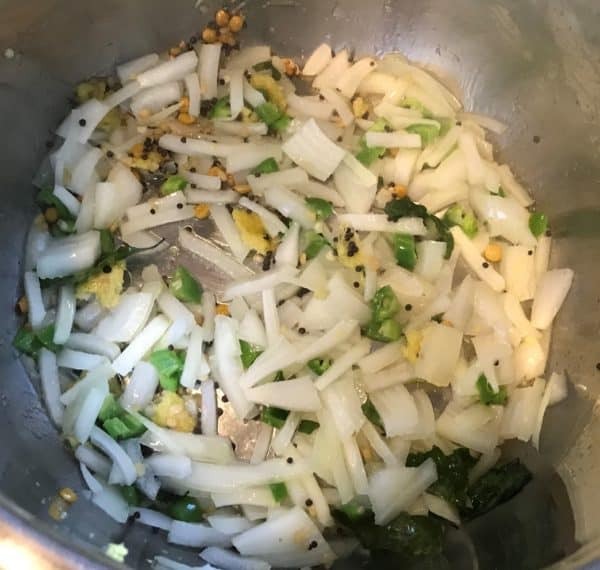 For upma, you could also just try to cook on sauté low after adding the hot water. I found that sauté low setting worked perfectly for carrot halwa too. Made it again today. It came out so delicious. Of course, I tried manual 2 minutes but got the burn sign. No more upma in IP but I guess I dont need an IP for it anyway. Hey Daisy – Sorry to hear, the newer ip’s are more sensitive. I agree that if it does not work in the ip, it is best to do on stovetop. It will not take too much extra time, just some monitoring. Thank you for sharing back your review! This is my first instant pot cooking trial. I followed all the steps, but after starting pressure cook, in a minute, the burn sign came on. So I turned it off, then i took out the instant pot and left it closed like you said. After cooling down, since it hadnt cooked for 2 mins, it did not come out like yours. But do you know why the burn might have come one? 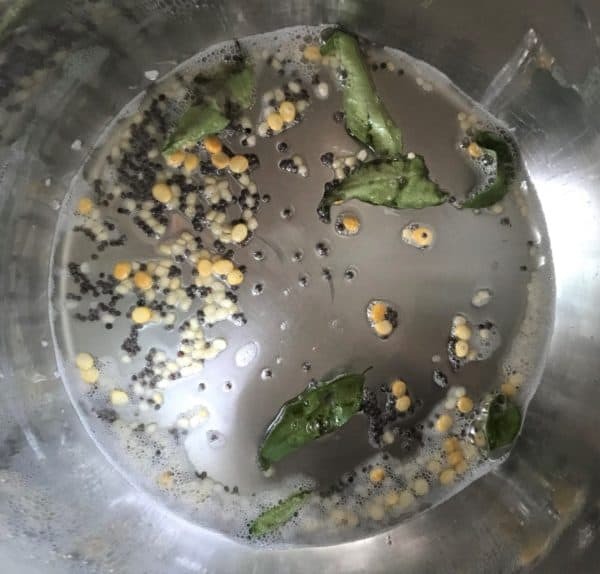 There was some upma sticking to the bottom of the pot. Hey Mala – Sorry to hear that the upma did not cook as expected. I have seen many posts where the new instant pot’s are more sensitive and show the Burn message. In my case, even if the upma initially sticks a little to the bottom, when you let is rest for 5 minutes it mixes well and is not sticking anymore. I hope the taste was good and you were able to have a breakfast. If I make it in 8 qt do I need any adjustments for water or cook time? Hey Karishma – Sorry to hear you are having trouble. The newer models of instant pot have been made much more sensitive, because of which the recipes created in other versions are not working as expected in them. I suggest to just keep upma on saute (low) for a few minutes until the water is soaked. Then leave the pot covered with a glass lid for 5 mins to complete cooking. how much water to add ? 3 cups water for 1 cup roasted Rava. I heated the water in the microwave. It should be mentioned on the ingredients list. Hope you enjoy it!